Arizona Solar Center - Will Trumping Obama’s Interior Department Help Solar? Will Trumping Obama’s Interior Department Help Solar? The solar industry is large enough to seek U.S. Department of the Interior (Interior) regulatory relief, irrespective of any debate over climate change. The President-elect is skeptical of anthropogenic climate change. He made clear on the campaign trail that he intends to roll back regulations affecting domestic oil and gas and coal production on public lands. But Mr. Trump has also evinced a more pragmatic, market-based “all of the above” approach to energy. Preserving and creating jobs appear to be some of his highest priorities. At 300,000 jobs to date, the solar industry is large enough to seek and possibly obtain regulatory relief in stride with more traditional resource extraction industries, irrespective of any debate over climate change. Many Obama Administration initiatives will be reviewed by the Trump Administration to “identify and eliminate unnecessary regulations that kill jobs and bloat government.” This article shows how Interior initiatives focusing on the solar industry may be modified as part of the Trump Administration’s broader effort to reduce regulation in general. The concept of landscape-scale public land planning has been a hallmark of Interior Secretary Jewell’s tenure. But developers across many industries believe Interior has used the concept to sharply restrict multiple-uses of public lands. The new Administration will likely take a long and critical look at Interior’s landscape-level efforts. 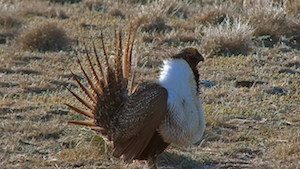 Chief among these will be Interior’s 67 million-acre Federal Sage-Grouse Strategy, which is currently subject to eight pending legal challenges. Bureau of Land Management’s (BLM) “BLM Planning 2.0” rule, which seeks to update BLM’s planning regulations with landscape-scale concepts, is another example. The new Administration’s scrutiny of these planning efforts could extend to recent large-scale planning initiatives focusing on renewable energy. Interior’s six-state, 100-million-acre 2012 Western Solar Plan is one such plan. While presented as a planning initiative designed to encourage utility-scale solar energy, many in the industry view the massive series of land use plan amendments (LUPAs) as a hindrance, in no small part because the plan removed 79 million acres of BLM lands from development. The plan did set aside a quarter million acres as preferential solar zones, but the best management practices imposed on those zones have often been viewed as much more restrictive than would otherwise be the case. When the oil and gas, mining and agribusiness industries seek relief from the new Administration for the Federal Sage-Grouse Strategy, the solar industry could collaborate to gain an audience over the Western Solar Plan as well. There is a reasonable chance of revision because the Western Solar Plan can be modified administratively by a series of LUPAs instead of by formal rulemaking under the Administrative Procedure Act or by act of Congress. The DRECP is a 22.5-million-acre LUPA that covers most of the southern quarter of the state of California, including some of the best solar and wind energy resources in the state. Initially presented as a tool for streamlining endangered species permitting for wind and solar projects on public and private lands, the DRECP has received a cold reception, with California counties notably refusing to sign on to the private lands segment of the plan. BLM nevertheless pressed forward in September 2016 by adopting the plan insofar as it applied to BLM lands. That decision designated roughly 6.5 million acres of lands as off limits to any form of development. The DRECP process reduced California BLM lands open to solar development under the Western Solar Plan by more than 50 percent, with further restrictions imposed on the remaining acres. While all indications point to a Trump Administration that will not favor renewable energy development over fossil fuels, landscape-level LUPAs like the DRECP risk modification if they are perceived to limit economic growth through unnecessary regulation. On May 26, 2015, US Fish and Wildlife Service (FWS) published a Notice of Intent outlining a proposal for a rule requiring a multi-layered permitting program under the Migratory Bird Treaty Act (MBTA). The permitting program would regulate private activities that inadvertently injure or kill members of most bird species in the U.S. The program would affect a wide range of industries and activities, reaching well beyond the renewable energy and oil and gas sectors that have been the subject of enforcement actions over the last several years. If finalized, the proposal almost certainly would draw legal challenges from industry stakeholders. No progress has been made since the initial announcement, however. The Trump Administration is unlikely to take the process any further. MBTA enforcement may also be influenced by the new Administration. FWS has relied on Court of Appeal decisions in the 2nd and 10th Circuits to enforce (or threaten to enforce) the MBTA’s strict criminal liability provisions against multiple wind and oil and gas facilities, sometimes resulting in multi-million-dollar settlements. However, the 5th, 8th and 9th Circuits have disagreed with this interpretation, holding that the MBTA applies to purposeful activities only (such as unlicensed hunting) and does not apply to unintentional “take” of migratory birds. The Interior Secretary under the Trump Administration could rely on the 5th, 8th and 9th Circuit court precedents to issue a regulation, or at a minimum, an internal policy memorandum, that prohibits enforcement of the MBTA against non-purposeful forms of take. This could help the solar industry. In June 2016, Region 8 of FWS released a draft bird and bat conservation strategy template that replicates similar guidance for the wind industry by recommending significant monitoring burdens for all photovoltaic facilities over 20 MW. While not mandatory, FWS would exercise “prosecutorial discretion” over enforcement of the MBTA in exchange for compliance with the guidance. Region 8 has indicated the draft template could be replicated nationally. Industry members have opposed the draft, in no small part because of a lack of conclusive data showing a “lake effect” that causes disproportionate avian mortalities at PV projects. FWS Region 8 lies within the 9th Circuit. If the Trump Administration eases enforcement of the MBTA, it would be a small step to extend its directive to Region 8’s proposed guidance as well. On Nov. 10, Interior released a final rule to establish a framework for the designation of preferred designated leasing areas (DLAs) for wind and solar projects that would be subject to competitive leasing rather than the current first-in-time, first-in-right regime. The rule would also codify certain wind and solar bonding, rental, megawatt capacity fee, and pre-application policies implemented by BLM for the past five years without formal rulemaking. The solar and wind industries have strenuously opposed the rule. Whether the competitive leasing concept remains will likely depend on whether the Trump Administration decides to alter the analogous competitive leasing regime applied to public land oil and gas leases for the past 30 years. The top-down DLA zoning concept might strike a Trump Administration as contrary to a market-based approach. The megawatt capacity fee may be perceived as an illicit tax outside Interior’s statutory mandate. However, the final rule likely will be published in the Federal Register before Dec. 22, 2016 and therefore take effect before the President-elect is sworn in. If that is the case, rescinding or modifying the competitive leasing rule would require a new rulemaking. The formal rulemaking process may handicap efforts to modify a rule that focuses almost exclusively on renewable energy facilities. There is little doubt Interior will place greater emphasis on the consumptive use of resources under the Trump Administration. In addition to reducing restrictions on fossil-fuel development, President-elect Trump’s focus on creating jobs and reducing regulation in general could extend regulatory change to the solar industry as well, irrespective of climate change persuasions.